San Francisco restaurants are some of the best in the United States. The combination of fresh seafood, plentiful California produce, and the many ethnic influences produce a cuisine that is innovative, diverse, and delicious. Some San Francisco restaurants are landmarks in themselves. Among these are the Cliff House overlooking the San Francisco Bay, the romantic and elegant Fleur de Lys in the downtown area and Greens, the classic vegetarian restaurant with views of the Golden Gate Bridge. San Francisco's diverse mixture of cultures has produced a cornucopia of ethnic San Francisco restaurants. Some are large restaurants serving large assortments of varied menu offerings. Others are small, often family-owned, cafes delighting locals and visitors with home style cooking from their particular homeland. Among these are the Mexican restaurants of the Mission District, the dim sum palaces in Chinatown, sushi bars in Japantown, and Italian bakeries and bistros in North Beach …and that's just for starters. 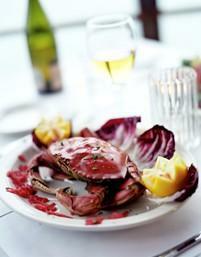 San Francisco's waterfront is home to a mix of favorite seafood restaurants. Among them are Aliotto's, a combination of Sicilian and California seafood fare, A. Sabella's on Fisherman%27s Wharf, Scoma's on Pier 47, a favorite for 30 years, and Pompeii's Grotto. Wherever or wherever you dine in San Francisco, you're sure to enjoy the experience. As in Paris, it's almost impossible to get a bad meal in the "City by the Bay."